Ever since the internet came along, our relationship to libraries has changed dramatically. But recent studies show that these institutions—pillars of the OG sharing economy—are still viewed as essential to American communities. So it's fascinating to take a look through the University of Illinois at Urbana-Champaign's collection of posters and propaganda from the American Library Association, an organization founded in 1876 and still going strong in its quest to make libraries—both physical and digital—cultural hubs for learning and leisure. 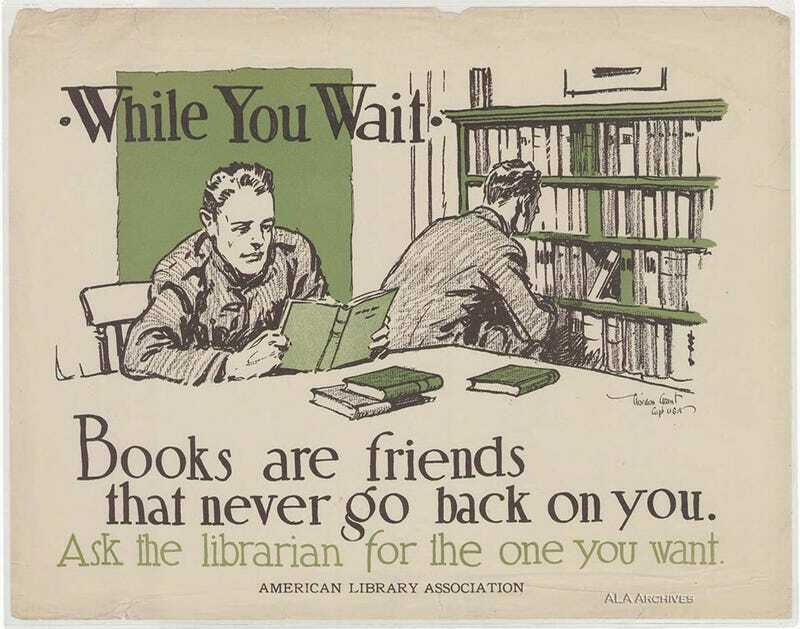 Lots of the images on file are from efforts to increase book donations from civilians during WWI, then later from the Victory Book Campaign during WWII (anyone particularly interested should check out the the posts over at Books For Victory, which has some great background info). Others offer an appeal to "make the public library the University of the People." Online access has obviously changed the game by democratizing info without the need for an actual building with actual books, but the concept of free access to a wealth of info is still relevant today.